Can you feel the cold yet? There have already been a few dark and dreary days here in Seattle since the beginning of fall. I can hardly wait for the days to get darker and shorter. One way to keep you warm during your moonlit walks in the middle of the night is to get a spooky beanie hat by Velvet Volcano. These are all for adults and do not fit children, so hurray for us! Some of the beanies are actually very cute. Come check them out! 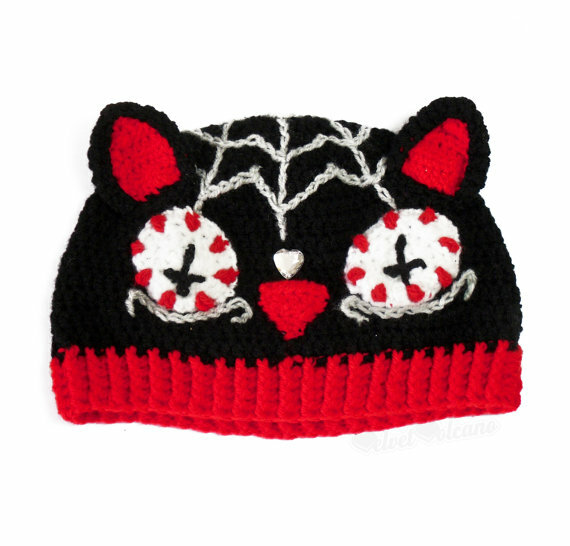 I didn't think anything adorable could be simultaneously sinister like this spooky black cat hat. The plus signs in its eyes are a little creepy, don't you think? I have to admit, I originally thought its eyes were peppermints. I love the web on the very top of the cap. Having an exposed eyeball leering at you is always an unsettling experience. 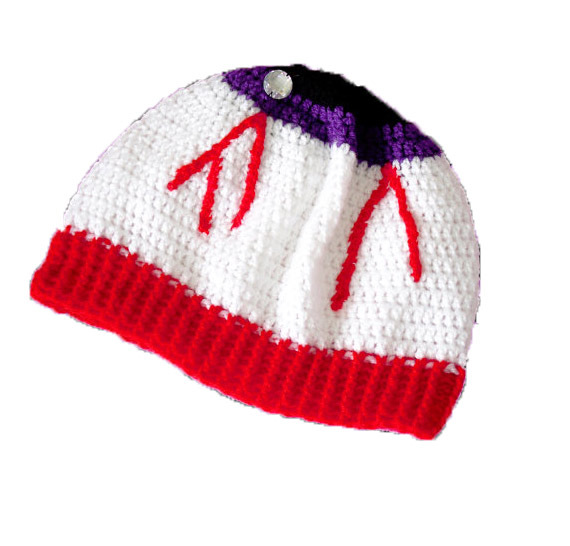 The crochet eyeball beanie is like a strange alien species with giant eyeballs on the top of their heads. The red veins popping out is a great feature! 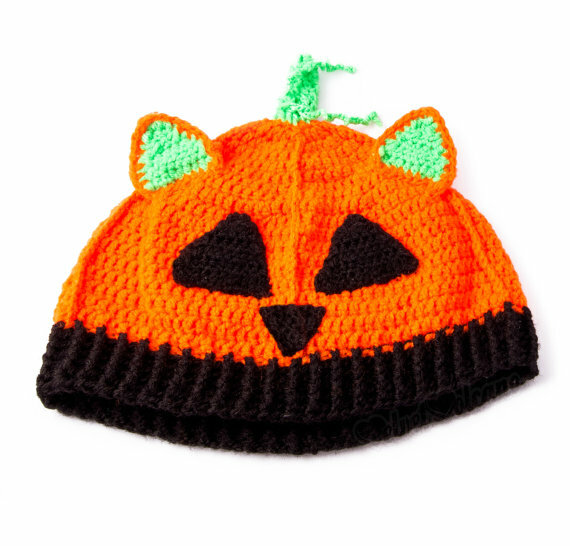 This is a simple pumpkin kitty beanie that would be fun for Halloween. I would honestly wear this as long as it is cold out, no matter the time of year. I'm laughing because the bright green stem on the top is really hysterical. I do like how wispy it is! 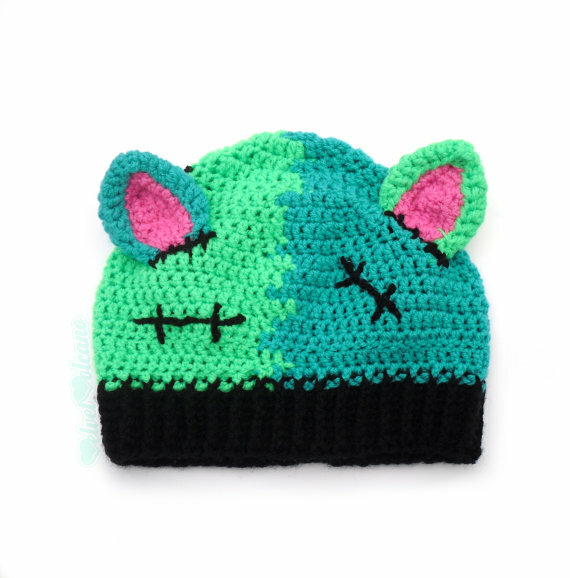 I am so tempted to get this FrankenKitty beanie. it's really cute and a little grotesque. I wouldn't ever wear a real FrankenKitty as a cap, that's a little too much. I really love the colors! It's great that the stitches go all the way around the head rather than just the eyes. 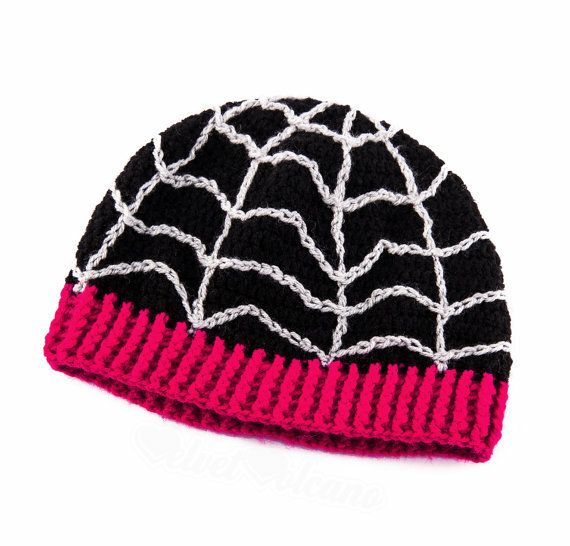 You might think that this spooky spider web beanie is too simple. It's actually the only one that can be customized to your own style. In fact, that means you can buy more than one and wear them for different occasions! I love these spooky beanie hats by Velvet Volcano. Would you ever wear any of these beanies for the chilly weather? Which one is your favorite beanie? Take a look at other crochet options on her Etsy store and comment below. Thanks for the feature :) what an awesome post! Thrilled you love our products! Though all of these beanies are adult-sized (because I am very against only kids having the cool clothing and accessories and us slightly more advanced in age being relegated to the same old, boring winter wear ;) ) they can be custom made to fit any age/size :).